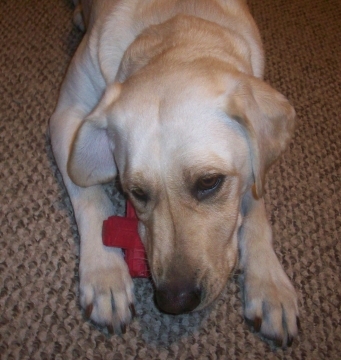 Maya playing with one of her Kong dog toys. Everyone once in a while I will write about a specific dog breed. The information is helpful and informative, but it can be a little dry. So I am going to do something a little different today. I am not just going to tell you about a specific dog breed, I am going to tell you about a specific dog. 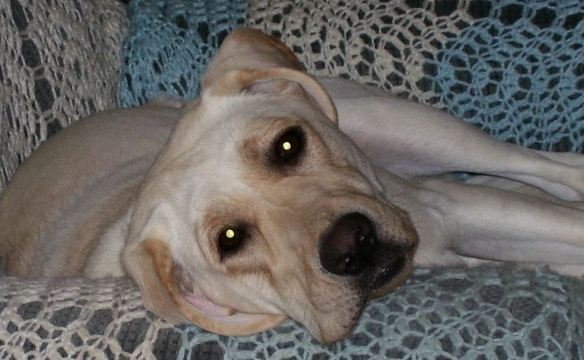 This very special dog is a Labrador Retriever and she is my Maya. While Maya does fit into the general characteristic mold of a Labrador Retriever, she is unique in her own way. Unlike most Labradors, she is not overly needy for affection. Oh, don’t get me wrong, she loves attention. But she doesn’t beg for it. Perhaps this is because I work from home and give her plenty of love and attention. But even when I was away from home working in an office all day, she didn’t cause any trouble while I was gone. When I came home, she was excited and we would play then go for a walk. Then for the rest of the evening she was quiet and content with laying down beside me on the couch or at my feet. Maya is a great cuddler. I’ve heard Labradors can be hardheaded, but I just don’t see that trait in Maya; not even an ounce of it. Maya is my first purebred Lab so I am not sure what the Barron’s Dog Breed Bible means when they say Labs can be hardheaded. I know what hardheaded means. Sephi could be stubborn at times. But I just don’t see how it could apply to a dog like Maya. Perhaps Barron’s meant something else. Or perhaps they are wrong. Do any of you have a Labrador and can explain to me what Barron’s might be referring to? Maya Wearing Daisy Diva Design Collar. Maya is the most amiable dog I have ever had. Every single dog I’ve had before Maya has been disagreeable in some way, whether with dog aggression, shy with people, or guard-dog qualities. Maya, however, loves everybody and every dog. One could be an ax-murderer and she would love them. I feel bad for her sometimes because she tends to be bullied by other dogs. Pierson can be a pest when playing with her but she just stands there and takes it, even if he is hurting her. Maya always let Sephi win. Right now Maya is laying at my feet, as quiet as ever. But say the words “walk”, “cookie”, or “outside” and I have a maniac on my hand. Goodness-forbid if someone comes over to the house. I have managed to get Maya to sit and stay while I answer my door or open the closet door for her food or her leash. But she whines impatiently and wiggles around so much that I question whether she is really obeying the stay command. And despite the fact that I have taught Maya not to jump on me or others, in her excitement she often forgets herself. At Dogtoberfest this year, she tried to jump on a lady who was petting her and ended up giving her a fat lip! Walks can be a nightmare too, especially when she sees another person or dog. She is getting much better, but she still has those moments when she is so excited that she pulls and barks. Maya Wearing Her New Pull No More Dog Harness. Maya is a very smart girl. She is not as smart as my dog Pierson but she is definitely smarter than my dog Sephi was. It doesn’t take long to teach her new tricks. If anything inhibits her training, it is her excitability. I have to keep training sessions short because if she gets too excited about doing tricks for treats, she stops listening and starts doing tricks at random until she finally does the one I asked for. When I try to get her to jump through the hula-hoop, like I taught Pierson, she jumps up but not through, thereby landing onto the hoop. She gets so excited about jumping that she doesn’t understand the concept of what she is supposed to do. The first time Maya saw a body of water, she ran so fast into the water that before I knew it, she was underwater, head and all. For a split second, I was worried I would have to rescue her. But she came out coughing, then jumped right back in and played for at least an hour. Check out this great video of Maya swimming at a public pool. Notice that a lot of the other dogs in the pool are also Labradors. So there you have it. 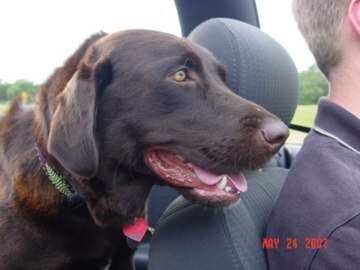 Information on the Labrador Retriever presented by my sweet, excitable, intelligent Maya. 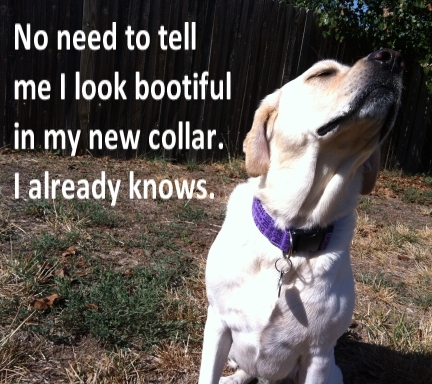 What is your Labrador like? 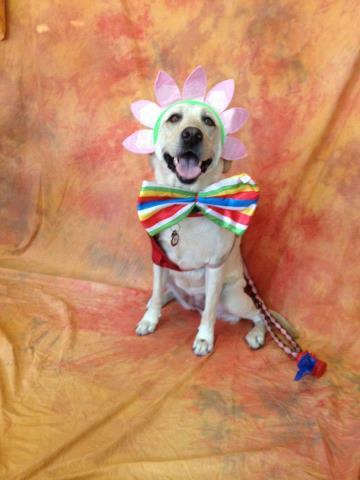 Here’s another great Lab – Callie. 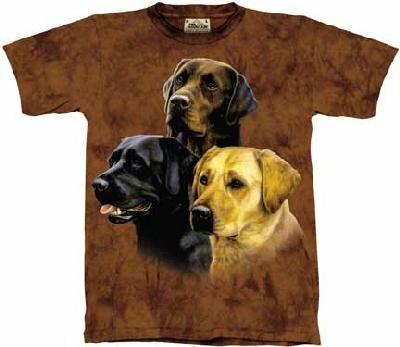 This and other great Labrador gifts at our Amazon a-store, Labrador Retrievers Gift Store. 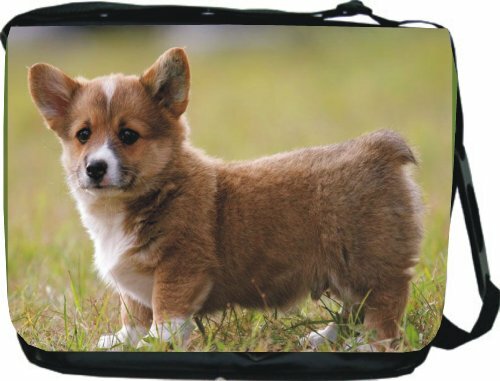 For a smallish happy fun-loving dog breed, check out the Corgi. 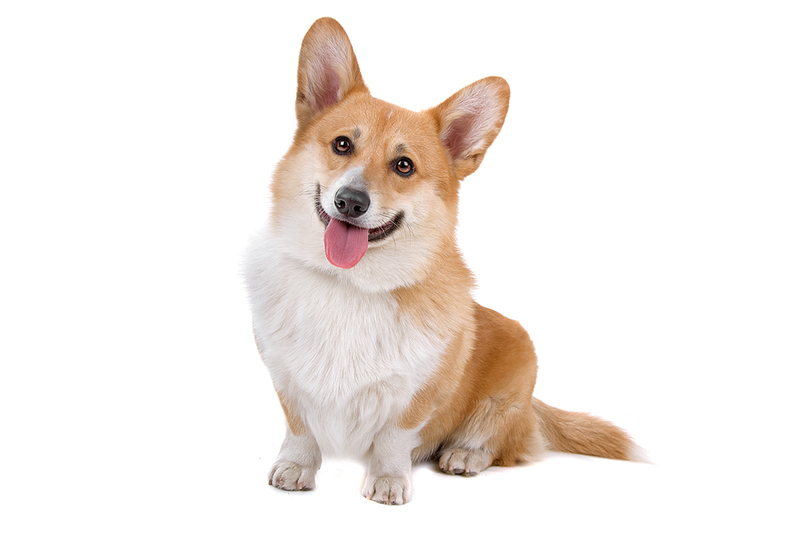 There are two types of Corgis, the Cardigan Welsh Corgi and the Pembroke Welsh Corgi. These two dog breeds are similar in many ways. In fact, they were once considered as one breed by kennel clubs and were often interbred. But there are some distinct differences. Before we get into how they are different, check out how they are similar. 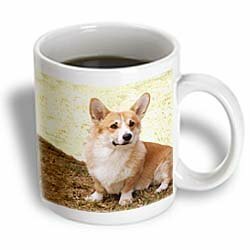 Corgis were Welsh cattle drovers brought to central Europe centuries ago. They were further developed in South Wales (Cardiganshire and Pembrokeshire). The Corgi didn’t really herd the cattle but drove or scattered them. Why would the Welsh want to drive their cattle? Because the land was owned by the Crown and the only way the Welsh could use it was for their cattle. So the further afield a herd could go the more land the Welsh could use. 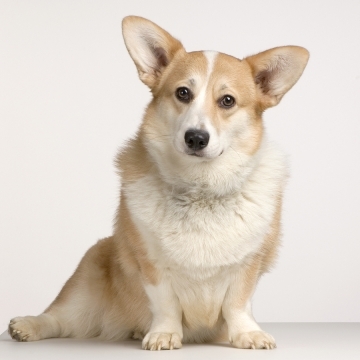 Corgis are short-legged dogs with a compact body. 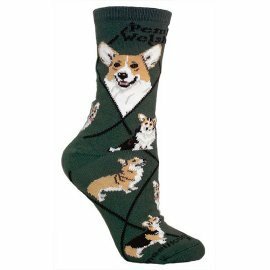 They stand relatively at the same height of about 10-12 inches (Cardigan up to 12.5 inches). They have a flat skull that is wide between the medium-sized erect ears. They have a harsh coat which is straight, fairly short, and dense. This coat needs brushing at least once a week. 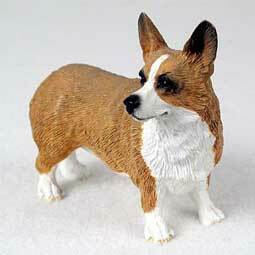 The Corgi dog breed may tend to bark a lot. Even though they bark, they can be relatively friendly with strangers. They are moderately active dogs which need daily exercise. They are somewhat playful, affectionate, can be good with children, and generally get along well with other pets. 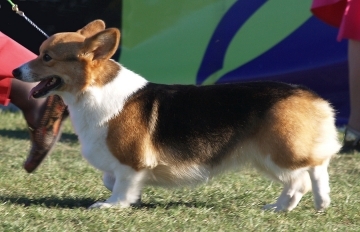 Both Corgi dog breeds are intelligent and easy to train. This is such a cool-looking and cool-sounding dog. I first heard about the New Guinea Singing Dog when I was doing an art collage on dogs from around the world (you know, like the Scottish Terrier, the Afghan Hound, the Japanese Chin). 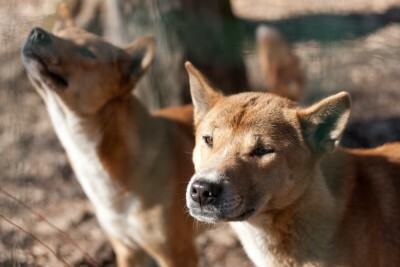 The New Guinea Singing Dog looks a lot like the Dingo. He has relatively the same build and a distinctive red coat. The few differences are that he generally has more white on his feet, face, and chest. And sometimes he has a little bit of black, or darkening, on his cheeks and/or muzzle. This is a very old dog breed. In its native land, he might live as a wild scavenger dog or as a pet. Many are kept in zoos. You might see some in zoos here in the US. So why is he called a singing dog? Well, he has a very distinctive sing-song howl. Here is a video of one singing. 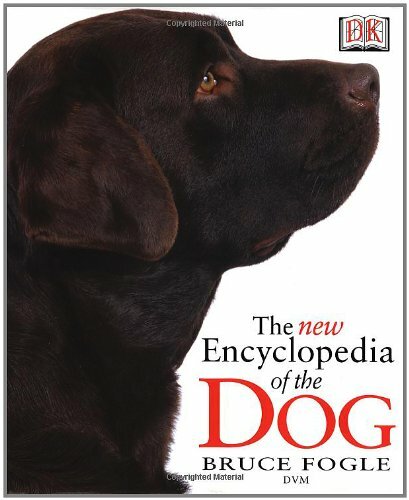 My two sources for information on this dog breed is “The New Encyclopedia of the Dog” by Bruce Fogle and Wikipedia. 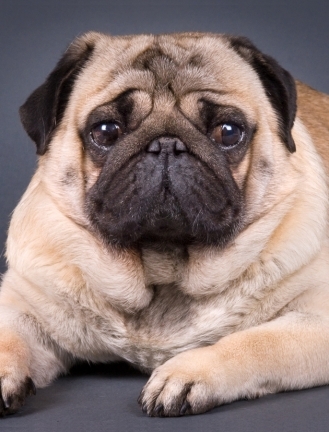 Pugs are wonderful dogs but they have a tendency towards a number of genetic health issues. Many of those issues are related to their short noses. If you are looking to get a Pug dog breed, you should know what some of the common health problems are and how to decrease the chances of your Pug having them. Brachycephalic syndrome covers a number of more specific respiratory issues including the soft palate being abnormally long and/or the nostrils being too small for the dog to breathe properly. The issues can be as minor as only causing your dog to make noise when he breathes. But sometimes the issue can be severe enough to require surgery. Even if your Pug doesn’t have these health concerns in severity, it is important to remember that their short noses make it so that they can’t tolerate heat as well as longer-nosed dogs. Some dogs may develop Pug dog encephalitis which is a genetic disorder where their brain gets severely inflamed. Symptoms include seizures, abnormal gait, blindness, and even death. 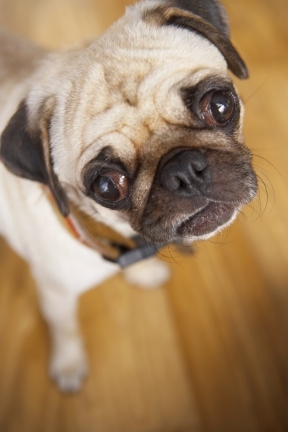 Two common eye disorders in Pugs include progressive retinal atrophy (PRA) and pigmentary keratitis. In PRA the retina gradually deteriorates while in pigmentary keratitis the retina develops dark scar tissue which eventually covers the entire eye, both which can eventually lead to blindness. Pugs also experience three common skeletal issues including hip dysplasia, patellar luxation (knee caps), and Legg-Perthes disease (femur hip bone). 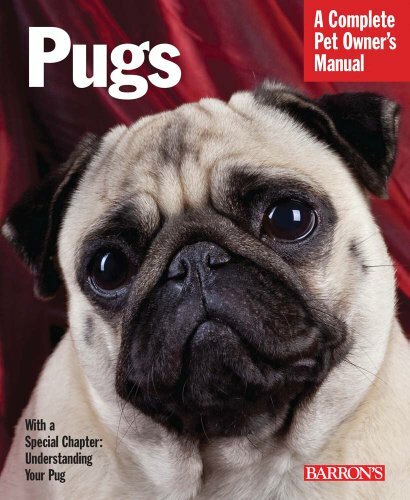 The Barron’s “Pugs: A Complete Pet Owner’s Manual” has some very good advice on how to shop for a quality Pug dog breed. They address breeders, pet shops, animal shelters, and breed rescue clubs. One very good point they made is, “In general, the smaller the “kennel” the more friendly the puppies it will produce and the more healthy those puppies will be.” So don’t go to pet shops. Visit the breeders in person at their location. The breeders should be providing certain health guarantees which last longer than a year (especially since some issues may not become evident until after several years). Good breeders will have done a number of tests and will willingly provide you with proof. Read up on the common health issues previously listed and determine which tests the breeder should have done. This is our final article on the wonderful Pug dog breed. If you missed the others, check out Parts I, II, and III. Part I talks about the history of the word ‘pug’. Part II is the history of the dog breed itself. And Part III is about the physical and behavioral traits of Pugs. 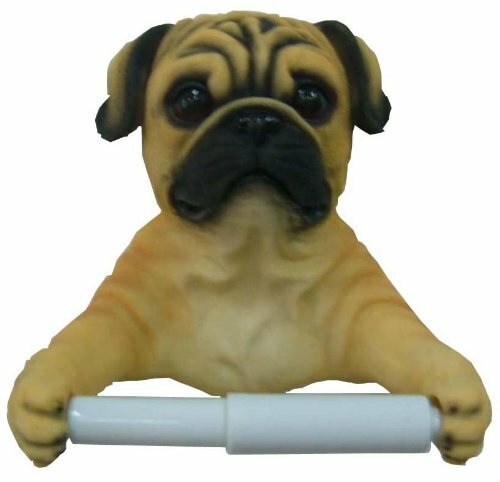 Check out those posts, all written in May 2012, and check out our All Things Pug Store by clicking HERE or one of the pictures below. A lot of dog in a little space. That is the meaning of the Latin phrase, “Multum in Parvo”, used to describe the Pug dog breed. Last week you learned the history of the Pug, but now we are going to tell you what he looks like and why this small breed is a lot of dog. A Pug’s coat is short and smooth. It is either all black or it is silver or apricot-fawn with a black mask, muzzle, ears, cheek moles, and trace down the back. This light colored body with a black face strongly resembles the colors of the fawn or apricot Mastiff. Because the coat is short, it requires minimal brushing. The Pug’s wrinkled face, however, requires regular cleaning, especially between wrinkles. 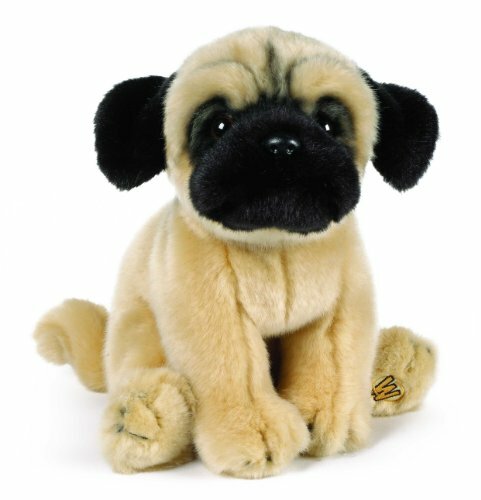 The Pug dog breed stands about 10 to 11 inches tall and should weigh between 14 and 18 pounds. Yes, he is a small dog. But it is his personality which makes him ‘Multum in Parvo”. The Pug’s body is square. His legs are moderate in length and proportionate to his cobby body. His chest is wide and rib-cage round. The Pug has a small short tail curled tightly over his back. The Pug’s head is round, and proportionately large as compared to his compact body. He has small thin ears described as either rose or button. His jaw is undershot and his muzzle is short and square. The muzzle should not be turned upward. Because of the short muzzle, Pugs do not do well in the heat. Please note that a few of the health concerns for a Pug (next week’s article) are due to the short muzzle. The Pug’s eyes are round and prominent. They should be dark in color yet bright and eager. Barron’s “The Dog Breed Bible” describes the Pug’s personality as “a blend of dignity and comedy”. They are loyal and have a zest for life which has earned them the Latin motto, “Multum in Parvo”. They can be as brave as a terrier when it comes to ‘playing with the big dogs’ but otherwise get along well with other pets. They are generally good with children too, but may take a bit to warm up to strangers. 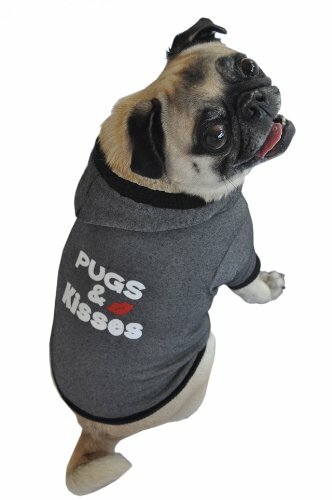 Pugs can be very affectionate and playful. For a small dog, his energy level is average and requires a short walk daily or a fun play session. Sometimes the Pug can be stubborn but he is generally eager to please. His amiable nature makes him easy to train if a positive reinforcement method is used. Harsher training methods may bring out his stubborn streak. If you are considering a small dog with little shedding, minimal exercise requirements, and yet gets along in almost any family and home setting, then the Pug dog breed may be for you. 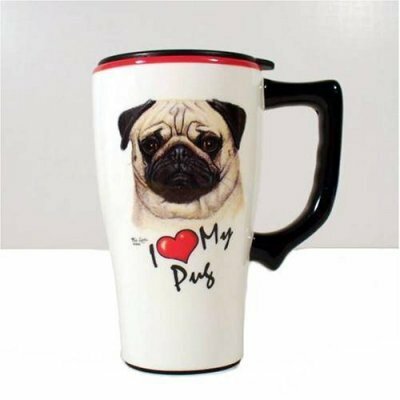 Whether you live on a farm or in a small apartment, whether you have children and other pets or live alone, the Pug can bring you much laughter and companionship. He really is a lot of dog in a little space. Come see us again next Saturday when we tell you some health concerns of the Pug, where to get one, and the best book for learning to care for and train your Pug. 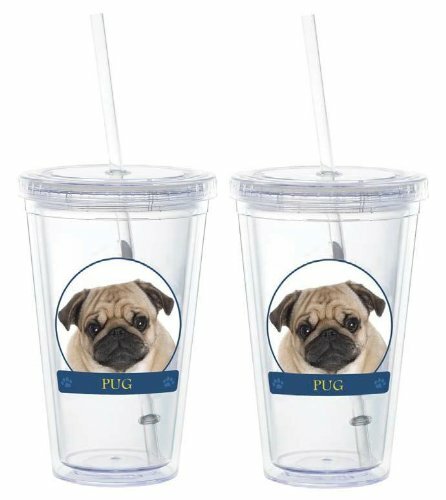 Also, check out our All Things Pug Gift Store by clicking HERE. 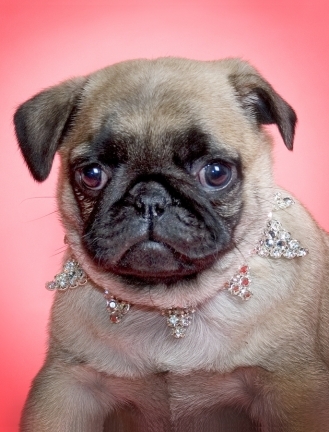 The Pug dog breed has had a very interesting history. He may have had connections with William the Silent, the king and queen of England William and Mary, as well as with Napoleon Bonaparte. He may also be responsible for the flat nose of the modern Cavalier King Charles Spaniel. A dog which many believe was a Pug dog breed named Pompey is credited with saving the life of the Prince of Orange known as William the Silent. Apparently, the dog barked and alerted Prince William of Orange when assassins approached his tent to kill him. This happened in France during William the Silent’s campaign against Spain during the Eighty Years’ War. There is some doubt about whether Pompey was a Pug or Kooikerhondje because some describe the dog as light colored while others say he was light colored with orange markings. It is also disputed whether the dog had a flat face. It is said that William the Silent’s grandson William III of Orange went to claim the English throne with Mary Stuart of England and their Pug dog breed. William and Mary, as they are commonly known, ruled as King and Queen of England, Scotland, and Ireland from 1689 – 1702. From there, the Pug dog breed slowly began to gain popularity across Europe. Connection with the Cavalier King Charles Spaniel? According to Wiki, it is likely that the Pug dog breed was bred with an older version of the King Charles Spaniel. The flat face of the modern Cavalier King Charles Spaniel is likely due to its European heritage with the Pug. During the French Reign of Terror (1793-4) Joséphine de Beauharnais was imprisoned in the Carmes prison while her husband was executed. It is said that Joséphine’s only visitor allowed was her Pug Fortune. Therefore, Fortune was used to conceal messages to and from her family. Later Joséphine de Beauharnais married Napoleon Bonaparte and became the first Empress of the French. This is the account given by Wiki. However, the account given in the Barron’s “Pugs: A Complete Pet Owner’s Manual”, Fortune was used to conceal love letters to and from Napoleon and Joséphine. This book also claims that Fortune had bitten Napoleon in the leg on his and Joséphine’s wedding night. According to the Barron’s “Pugs: A Complete Pet Owner’s Manual”, the first Pug did not come to the United States until after the Civil War. Even though it was one of the first 15 dog breeds to be recognized by the American Kennel Club (AKC), it declined in popularity. The Pug has slowly risen back into American hearts and is now the 26th out of 173 most popular dog in the US (it was 13th out of 155 in 2006). There is a lot more interesting history on the Pug dog breed in the Barron’s “Pugs: A Complete Pet Owner’s Manual” and on Wiki. 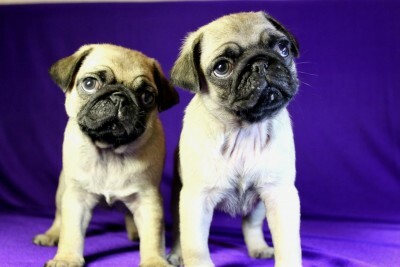 Check them both out then visit us again in a couple of days regarding the Pug’s characteristics. If you didn’t have a chance to check out our most recent article regarding the history of the Pug dog breed’s name, please check it out. You can also find out more information on the Pug’s characteristics next week. The Pug dog breed has a very interesting history. They are first noted in the Shang Dynasty in ancient China and were bred as lapdogs. They made their way to Tibet and Japan and eventually to Europe via the Dutch East India Company. The Pug dog breed has an interesting European history with William the Silent, William and Mary, and Napoleon Bonaparte. And there is also an interesting history regarding the word pug. According to the Barron’s “Pugs: A Complete Pet Owner’s Manual“, the first record of the word pug being used in the English language was in 1566. And it wasn’t used to refer to a dog. It was used as a term of endearment for a person. Later it came to refer to a courtesan or a bargeman. Later still (1600s) it came to mean demon, monkey, or sprite. It is possible that when monkeys were first referred to as pugs, it later came to describe the Pug dog breed as pugs because of the similar flat face. Others claim that the word pug comes from the latin word pugnus which means fist and the Pug dog breed’s face when viewed from the side resembles a closed fist. There is even a theory that the word pug is derived from the mischievous character Puck in Shakespeare’s A Midsummer Night’s Dream. The wrinkle on the Pug dog breed’s forehead is called a Prince Mark because the wrinkle resembles the Chinese character for prince. Visit us next week for the history of the Pug dog breed with William of Orange, Napoleon, and the Pug’s history in the United States. · The Rhodesian Ridgeback is also known as the African Lion Hound because he used to be a lion hunter. · The Rhodesian Ridgeback is named for the ridge of hair on his back, running from shoulders to hips, which grows in the opposite direction as his other hair. · The Mastiff, Bloodhound, Greyhound, and terrier dogs bred with the native dogs of Africa to give us the Rhodesian Ridgeback. · The native Hottentot tribal hunting dogs in Africa from which the Rhodesian Ridgeback dog breed is derived also had the distinctive ridge on their back. · The Rhodesian Ridgeback is generally a very healthy robust dog but are uniquely prone to a skin condition called Dermoid Sinus. · While the Rhodesian Ridgeback was used to hunt lions, he never actually attacked a lion. Him and two of his pals would track the lions, then distracted them for the huntsman on horseback. For more interesting facts on the Rhodesian Ridgeback dog breed, check out our article, “Information on the Rhodesian Ridgeback / African Lion Hound Dog Breed” on Hub Pages. Since we are considering a Border Collie as a new member of our family, I thought it would be helpful to go over some general characteristics of Border Collies and other herding dogs. A herding dog can make a great family pet if you know what to expect. The most notable characteristics of a herding dog are his intelligence and high energy. If you are considering getting a herding dog as a pet, be prepared to give him plenty of physical and mental exercise. Without one or the other, a herding dog can develop a number of behavior problems including digging, barking, chewing, and more. 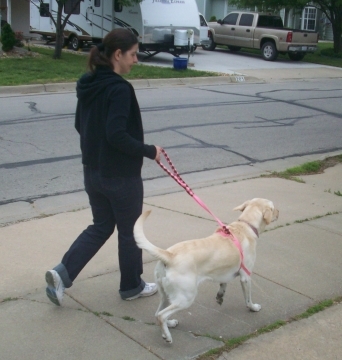 Provide physical exercise with walks, runs, fetch, disc throwing, and/or agility. 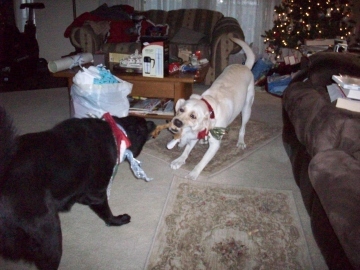 Provide mental exercise with obedience training and fun dog games like hide-and-seek. Because herding dogs tend to be very intelligent, they are also easy to train. It is not at all necessary to use negative reinforcement training with a herding dog. 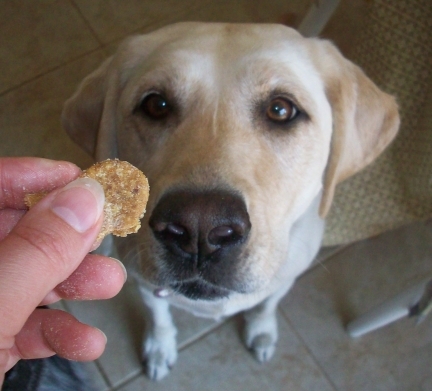 They respond very well to reward-based training, especially if the reward is a certain treat or toy. Training in this way goes far in developing a strong bond between a person and his herding dog. With that being said, a herding dog can develop such a strong bond that separation anxiety can become a problem. If you are considering getting a herding dog, be prepared to crate train him right from the start. And desensitize him to you leaving him alone as soon as you can in order to minimize separation anxiety issues. Herding dogs generally love to chase things. They were bred to chase down livestock and drive them back into the group. Sometimes small animals such as a cat can be a problem for a herding dog. Even children can be an issue for them. If a child is running, the herding instinct may kick in and the herding dog may chase down and try to ‘herd’ the child back ‘in line’. However, with proper socialization and desensitization a herding dog can do very well with small pets and children. The love loyalty earned from a herding dog is a wonderful thing. 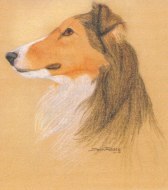 Years ago when I was a girl I had a Shetland Sheepdog name Cassie (pictured above). She was the most intelligent and most devoted dog I have ever had. Her loyalty to me tended to make her skittish towards strangers which only got worse as she got older. But she didn’t have separation anxiety and she didn’t try to ‘herd’ me or other children or pets. Cassie can never be replaced but if I decide to get another herding dog, I hope he/she is at least half as loyal and intelligent as she was. 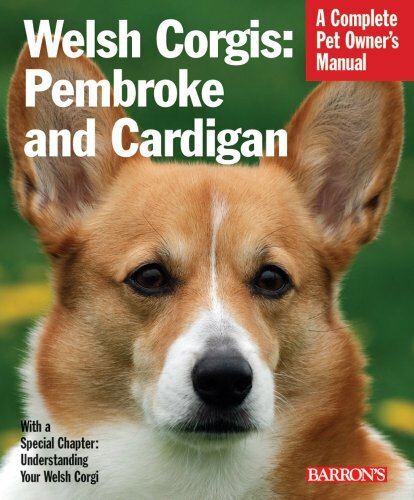 To learn more about herding dogs, check out some dog breed books at our Dog Lover’s Book Store.